Graphic templates support multicolor text, full-color images, and gauges with color gradients. These templates provide visually rich complications for the Infograph and Infograph Modular clock faces. 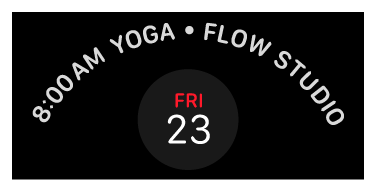 The Infograph and Infograph Modular clock faces are available only on Apple Watch Series 4. A template for displaying an image in the clock face’s corner. A template for displaying an image and a gauge in the clock face’s corner. A template for displaying text and a gauge in the clock face’s corner. A template for displaying stacked text in the clock face’s corner. A template for displaying an image and text in the clock face’s corner. A template for displaying a full-color circular image. A template for displaying a full-color circular image and a closed circular gauge. A template for displaying a full-color circular image, an open gauge, and text. A template for displaying text inside a closed circular gauge. A template for displaying text inside an open gauge, with a single piece of text for the gauge. A template for displaying text inside an open gauge, with leading and trailing text for the gauge. An abstract superclass for all the circular graphic templates. A template for displaying a circular complication with text along the bezel. A template for displaying a large rectangle containing text. A template for displaying a large rectangle containing text and a gauge. A template for displaying a large rectangle containing header text and an image.